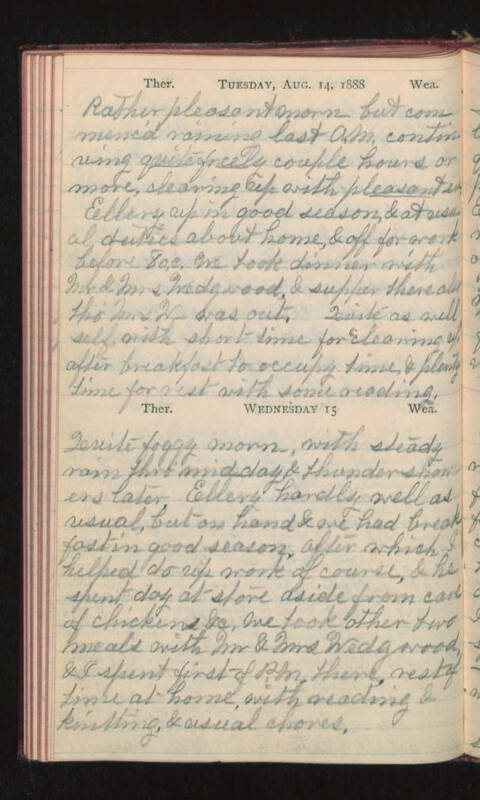 Tuesday, Aug 14, 1888 Rather pleasant morn but commenc'd raining last A.M. continuing quite freely couple hours or more, cleaning up with pleasant (?). Ellery up in good season & at usual duties about home, & off for work before 8 o.c. We took dinner with Mr & Mrs Wedgwood, & supper there also tho' Mrs W- was out. Quite as well self, with short time for "cleaning up" after breakfast to occupy time, & plenty time for rest with some reading. Wednesday 15 Quite foggy morn, with steady rain thro' mid-day & thunder showers later. Ellery hardly well as usual, but on hand & we had breakfast in good season, after which I helped do up work of course, & he spent day at store aside from care of chickens &c, we took other two meals with Mr & Mrs Wedgwood, & I spent first of P.M. there, rest of time at home, with reading & knitting, & usual chores.